Hills Science Plan has formulated a range of premium cat foods, that are nutritionally complete, including lifestage varieties that will provide your adult cat, kitten or mature senior with a balanced food that contains all the energy, protein, essential vitamins and minerals a cat food should contain to keep them active, fit and healthy! Regardless of the variety you choose all hills science plan cat foods contain beneficial supplements, including essential Omega 3 & 6 fatty acids to nourish your cat's skin and promote a shiny coat, with added taurine to help maintain a normal heart function and retinal structure. Each hills science plan cat food is also low in magnesium and phosphorous to help protect your cat's urinary tract and to maintain healthy kidneys, by regulating the level of phosphorous in the cat food. 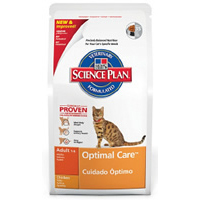 Hills science plan also adds to each cat food variety, a unique blend of antioxidants to boost your cat's immune system, reduce cell damage and aid growth, to give your cat extra protection against diseases. Lastly all hills science plan cat food recipes do not contain any artificial colours, flavours, preservatives or hidden fillers used to cheaply give bulk to cat food or animal derivatives that are known to cause food related sensitivities, including digestive disorders and skin complaints, such as itchy skin and loose digestion. Please note there is no need to supplement hills science plan cat food with any other food, including tinned food or pouches! Hills science plan: 5 stars out of 5 based on 4 user reviews. I feed my cat every day with these biscuits and he never turns up his nose at them. They are easy to dole out, odourless and (apparently) tasty. I think they are really good for his teeth too. A bit expensive to buy on a regular basis but worth their weight. Service was excellent as items delivered in two stages as one was out of stock - Thank you!